“I was not sorry when my brother died”. When a book starts like that, you can only wonder what’s going to happen next. Nervous Conditions is the story of Tambu, a young girl in colonial Rhodesia (present-day Zimbabwe), and her quest to educate herself. Throughout her childhood, Tambu longed to learn but was hampered by the men in her life - her father, Jeremiah, who felt education was wasted on women, as women couldn’t cook books, and her brother, Nhamo, who treated her badly and found it funny that she longed to go to school. She finally gets her chance, when her brother’s death leads her uncle Babamukuru, to sponsor her education in the missionary school where he is a headmaster. Here, Tambu is introduced to an affluent and more western lifestyle and finally gets the education she longs for. But her new life with Babamukuru is far from rosy and through her thoughts we get a glimpse into her education, her life and her view on gender and society. One of the issues Nervous Conditions explores is gender. Here men and women have a place in society and it is very difficult to cross those gender boundaries – women are expected to live according to certain rules. The book has different representations of women – there’s Maiguru, Tambu’s aunt and Babamukuru’s wife, who has a Masters degree but still dotes on her husband, plays the devoted wife and mother, is never allowed to express her opinion and is constantly sad because of that; there’s Nyasha, Tambu’s cousin and Babamuru’s daughter, who challenges gender stereotypes, and gets into a lot of trouble for doing that. She also resents her mother for conforming to ideals of how a woman should behave, even though she is educated; and there’s Lucia, Tambu’s aunt, who is uneducated but extremely feisty and is not afraid to express her thoughts. In addition to this, we see the effects of colonialism - Tambu's experiences in the mission school where she gets a western-style education, and the effect that this may ultimately have on Rhodesian culture. As well as views of different types of Africans - those that follow a sort-of English lifestyle, like Babamukuru; and those that still follow a so-called "traditional" lifestyle like Tambu’s parents. There are also issues of battling with two cultures, which Nyasha especially faces. On one hand she has been exposed to English ways through spending her formative years in England, but on the other she is in some way being punished by her father and classmates for not being African enough – for losing her African identity and not remembering her language and the customs. Nyasha’s constant struggle with these two cultures leads to some dire consequences on her physical and mental well-being. Nervous Conditions is filled with a lot of opposites - man/woman, white/black, rich/poor, tradition/progression, educated/uneducated – and we see how Tambu negotiates with all these opposing ideas as she strives to better herself. I had very mixed emotions about this book. I related to some extent with the gender issues that were being explored in it – especially the ones about a woman’s place in society and trying to come to terms with that as a young girl. But at times I was also frustrated. I found myself starting and stopping the book many times (at one point I even stopped reading it and started reading another book). I wouldn’t call it a page-turner, but it really makes you think about gender and society. This one is on my shelf and I'm really looking forward to it, despite the issues you had with it. Sounds interesting. I would really love to know what you think when you get the chance to read it. let me first thank you for the good work you are doing. I too am aspiring to do what you do, blog about African Literature. I find your blog very stimulating. 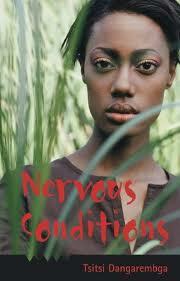 Nervous Conditions is my favorite book and Nyasha my favorite character. I loved how thoughtful and well planned out it was. The themes between the opposites (as you pointed out) were well structured to drive the point home. Maybe I say this because I read the book in high school and we thoroughly went through the themes and everything. I am willing to discuss any points you would like to about the book. Thanks! Im an art teacher from Argentina, Im planning an art lesson for students who just finished reading this book...your review was really complete.